The Artist Locations Part 3, Harold Lloyd, and Safety Last! After first posting about the location and studio connections between The Artist (2011) and Charlie Chaplin and Mary Pickford, and then posting about the connections between The Artist and Roger Rabbit and Buster Keaton, it’s time for Harold Lloyd to get in on the act. The Artist begins with the triumphant 1927 Hollywood premiere of silent film star George Valentin’s latest hit movie, A Russian Affair. In my first post I explain that the Warner Bros. backlot stood in for exterior shots of the theater. The interior scenes, where George basks in the adulation of his fans, was filmed inside the historic Orpheum Theater, located in the heart of the Los Angeles Historic Core, at 842 S. Broadway. Click to enlarge. This circa 1928 photo looks up Broadway from Tenth Street (now Olympic). The newly completed Los Angeles City Hall appears as the white tower in the far background. Harold Lloyd filmed the clock stunt from Safety Last! (1923) on the roof top of 908 S. Broadway (red oval above), just steps away from the Orpheum Theater that opened in 1926. 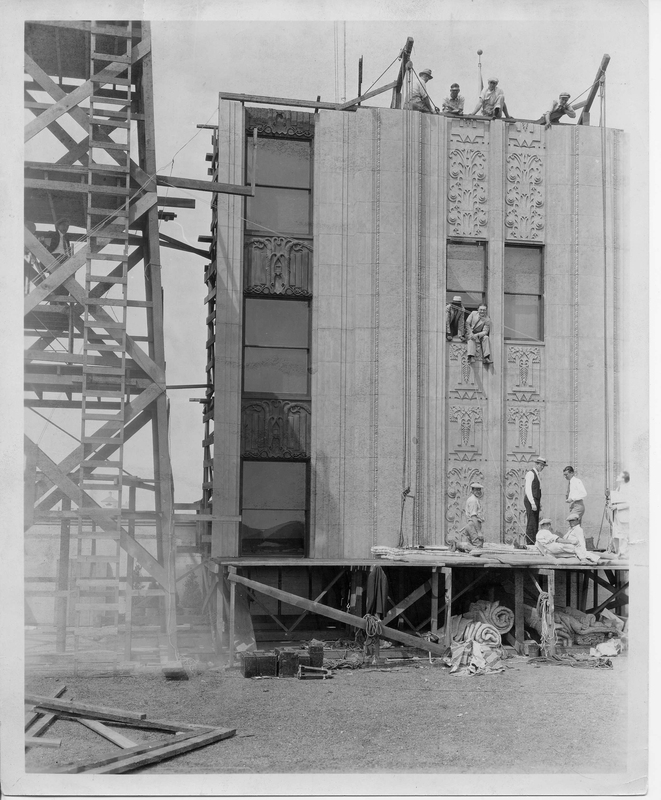 Today the Art Deco Ninth and Broadway Building, completed in 1930, obscures the painted Orpheum Theater wall sign. The yellow oval marks where Lloyd returned to film climbing stunts in Feet First (1930), see further below. California Historical Society, Title Insurance and Trust Photo Collection, Department of Special Collections, University of Southern California. The Orpheum Theater first opened February 15, 1926. No expense was spared in the theater’s design and construction, from its beautiful marble lobby and magnificent chandeliers, to the leaded glass panels beneath its enormous balcony. In its heyday, Will Rogers, Jack Benny, Burns and Allen, Edgar Bergen and Charlie McCarthy, and the Marx Brothers all played at the Orpheum. Mr. Orpheum, for whom the theater was named, was the “O” of RKO Pictures (Radio-Keith-Orpheum). The theater’s famous Mighty Wurlitzer pipe organ is the last remaining originally installed theater organ in Los Angeles. The theater is one of the crown jewels of the Broadway movie palaces located in the downtown Historic Core, and appears frequently in movie and television productions. Matching views from the Orpheum Theater stage, appearing in The Artist, and following the Los Angeles Conservancy's 2011 screening of Safety Last! Harold Lloyd filmed his iconic skyscraper clock sequence from Safety Last!, and similar death-dying scenes from his second talking picture Feet First, on the rooftops of extant buildings located just steps from the Orpheum Theater appearing in The Artist. In all, Lloyd filmed five building-climbing stunt pictures in the Los Angeles Historic Core, which I dissect in great detail in my Harold Lloyd location book Silent Visions. Click to enlarge. Harold Lloyd filmed similar climbing stunts for his second talking feature Feet First atop the Southern California Gas Company Building, the yellow oval in the prior historic photo. His rooftop set appears in greater detail at the right. Lloyd built a similar set and camera tower for the clock sequence in Safety Last!, filmed atop 908 S. Broadway, the building marked with a red oval above. 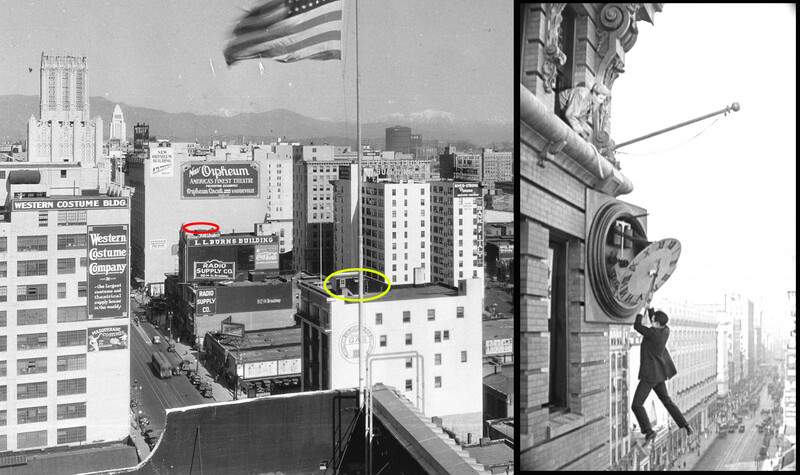 The vertical blade sign for the Orpheum Theater is marked with a yellow box in both images. The Academy of Motion Picture Arts and Sciences. Color image Jeffrey Castel De Oro. Click to enlarge - during the filming of Feet First (1930). Lloyd achieved the illusion of filming at great height by constructing the facade of a building atop a tall building, adjacent to a tall camera tower. The camera looked down from the tower on the face of the set, and the street far below, while keeping the real building’s roof outside the bottom of the movie frame. Because the camera recorded exactly what was there to be seen, these scenes crackle with authenticity that blue-screen computer effects fail to replicate. This aerial view shows the proximity of the Orpheum Theater to where Lloyd filmed stunt scenes from Safety Last! and Feet First. (c) 2012 Microsoft Corporation, Pictometry Bird's Eye (c) 2010 Pictometry International Corp.
Suzanne Lloyd and the author introducing Safety Last! at the Orpheum Theater, by Stephen Russo, GSC Productions. Harold’s grand-daughter Suzanne Lloyd and I had the honor of introducing a sold-out screening of Safety Last! on June 29, 2011 at the Orpheum Theatre, in conjunction with the Los Angeles Conservancy’s “Last Remaining Seats.” As part of the show, I prepared a self-guided walking tour of the downtown Los Angeles locations used by Harold Lloyd in Safety Last!, along with locations from Lloyd’s climbing stunts in Never Weaken (1921) and Feet First (1930), and behind the scenes images showing how Lloyd staged his famous skyscraper-climbing sequences. You can access the tour here. Harold Lloyd Safety Last Tour – Silent Visions. Be sure to see Part 4 of my posts about the The Artist here. Another of my posts about Safety Last! appears here. The Artist (C) La Petite Reine, The Weinstein Company. This entry was posted in Harold Lloyd, Lloyd Studio, Lloyd Thrill Pictures, Lloyd Tour, Los Angeles Historic Core, Safety Last!, The Artist and tagged Broadway, Feet First, Harold Lloyd, Lloyd Studio, Lloyd Thrill Pictures, Los Angeles Historic Core, Man on the Clock, Never Weaken, Orpheum Theater, Safety Last!, Silent Comedies, Silent Movie Locations, Silent Movies, Stunt Climbing, The Artist, the artist filming locations, The Artist locations. Bookmark the permalink. 10 Responses to The Artist Locations Part 3, Harold Lloyd, and Safety Last! Bert Wheeler (of Wheeler & Woolsey) was appearing at the Orpheum in 1928 during his summer hiatus from the Broadway hit RIO RITA when Harold Lloyd saw him there and offered him a screen test, to make two reel comedies (similar to the ones Lloyd produced with Edward Everett Horton). Since Bert was still under contract to Florenz Ziegfeld he had to turn down Lloyd’s offer. But Harold filmed a screen test of Wheeler anyway and gave it to Bert as a present. Pretty generous of Harold!